Protecting military and veterans education benefits is a top policy priority for IAVA and its 425,000 members. IAVA, which led the passage of the Post-9/11 GI Bill in 2008, has sought to focus national attention on congressional attempts to cut the earned veteran benefit. 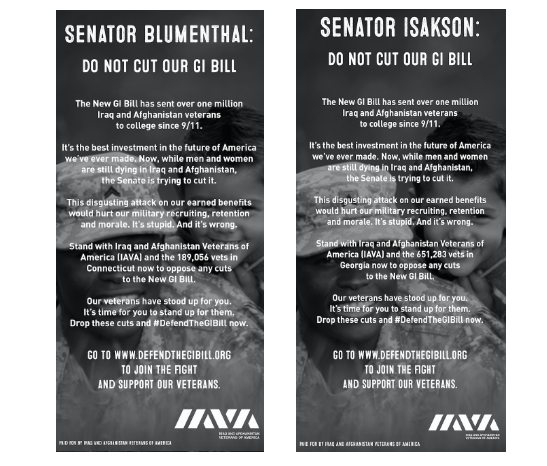 IAVA seeks to prevent cuts to the GI Bill in the last few days before the summer recess. The Post-9/11 GI Bill has been used by nearly one million veterans and their family members to accomplish educational goals and chart new career paths. Since IAVA launched the #DefendTheGIBill campaign, IAVA members have sent more than 31,300 messages to Congress asking them to take a stand and opposed any cuts to the Post-9/11 GI Bill and promise to never use veterans’ benefits as a piggy bank. Learn more about the fight to protect the GI Bill and the members of Congress who have taken the pledge to oppose the cuts here. Download a copy of Senator Blumenthal’s Ad HERE and Senator Isakson’s Ad HERE.